Most of the time you will not need to worry about Gtk Engines. But Gtk Engines are application libraries that Gtk Themes use to draw widgets (elements such as button, tabs and list boxes) on the screen. A Gtk Theme may use multiple Gtk Engines but most use only one. Gtk Engines should only need to be installed once. And the only Gtk Engine that I add to my system is Murrine-SVN. From that link I install either the i386 or AMD64 package depending on which install I am using. If Gtk Themes require a certain engine than most themes will mention it. 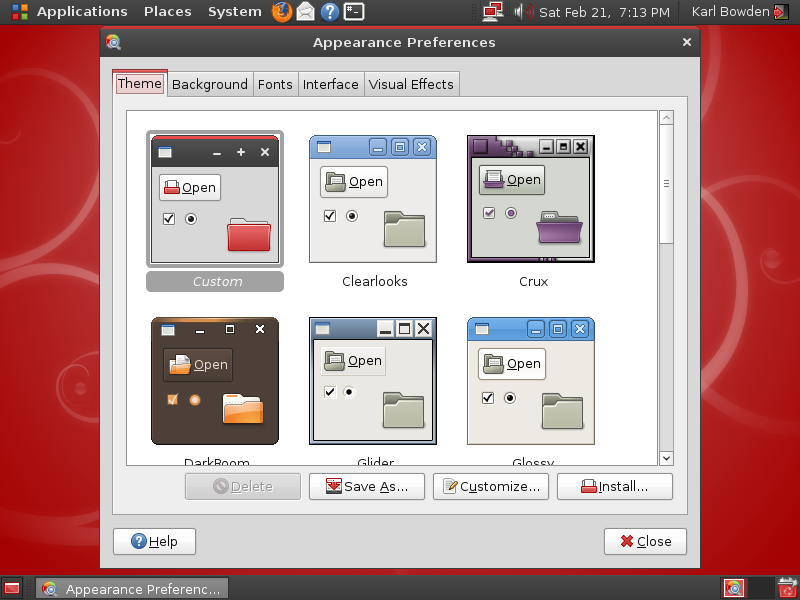 The most abundant themes available are Gtk Themes. They are easy to find on gnome-look.org. The current theme I use is Shiki-Colors. Gtk Themes are easily installed by dragging the dragging the downloaded archive into the Appearance Preferences Theme tab, then clicking Install. Some downloaded archives will have to be extracted first by right clicking and selecting Extract here.. Window borders by default in Ubuntu are controlled by an application called Metacity. Although the name Metacity may not be mentioned in the Appearance Preferences application, it is still handy to know when looking at the running applications in Ubuntu and when looking for new themes. There are other applications that decorate the window borders such as Enlightenment (incl, e16 and e17), IceWM, Fluxbox, Beryl, Emerald, 9wm, AfterStep, Blackbox, KWM, xfwm, ion and many more. None of which have themes compatible with Metacity. So look for Metacity when searching for new themes to decorate the window borders. Metacity themes are installed the same way as Gtk Themes. Find Metacity themes at gnome-look.org too. And lastly icon themes determine the look of most visible images. Pictures on menus, buttons, the desktop and file icons. Easily installed the same way as Gtk Themes and Metacity themes and found on gnome-look.org too. Once Gtk, Metacity and Icon themes have been installed they can be selected by clicking the customize button on the Theme tab of Appearance Preferences where they are also broken up into their own tabs. Controls, Window Borders and Icons. If the Gtk Theme supports it, it’s colors can be customized on the Colors tab. Each of the changes should take effect immediately except some parts of Firefox and OpenOffice. And if the combination of Gtk Theme, Colors, Window Borders and Icons is satisfactory, the combination can be saved using the Save As button. The next simple change is the Background / Wallpaper. Most people are familiar with this concept and the selection of background images can be kept seperate from the actual images on your hard drive by using the Add and Remove button on the Background tab in Appearance Preferences. Many decent backgrounds can be found all over the internet in almost any preference imaginable. Save them to your prefered location then add them to the backgrounds tab by either dragging them in from the file manager or using the Add button and navigating to them. And lastly the great thing about most Linux applications is that they are ‘resolution independent’. Ie, they do not use fixed widget positioning, or in other words, if you like large fonts, you can have large fonts and the windows on you screen will adjust their size so as non of the text will be obscured. If 20/20 vision is not your forte, then Linux is your answer. Changing the font in each of the selection boxes on the Fonts tab of Appearance Preferences should have immediate effect and should be adjusted to you personal preference. The Rendering preferences on the bottom section of that tab should also be used to select the best looking fonts of the 4 previews. For most LCD monitors (incl Laptops) the best option is Subpixel Smooting which smooths the orders of colors on the edges of the fonts according to the order of the colors displayed on LCD monitors. This entry was posted in Desktop, themes, Ubuntu and tagged Desktop, fonts, gnome-look, gth-themes, gtk-engines, metacity, themes, Ubuntu, ubuntu-8.10, wallpaper. Bookmark the permalink. Both comments and trackbacks are currently closed.